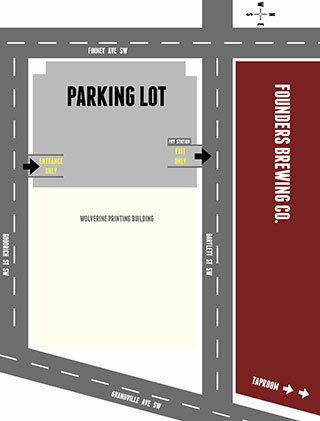 FAQ - Founders Brewing Co.
Where would you suggest that I park? How can I get my parking validated? We have a gated parking lot between Goodrich and Bartlett (just south of our facility). To ensure that your parking is validated, please present your ticket to your bartender/server when cashing out. You’ll receive up to five hours free of charge, after which a $2.00/half hour fee will apply. There is no charge between 11pm-8am so any cars left overnight (safety first!) will not incur any additional charges. As of now we have limited space in our lot, however, there are pay lots around us as well as plenty of street parking. Please do NOT park in the abandoned lot to the west of the building. Violators will be towed. It’s my birthday, and I’m planning to go out with friends and family to celebrate—and we want to visit the Founders taproom. Can I make a reservation or call ahead for a table? Unfortunately, we do not take reservations and do not hold tables for anyone, regardless of the occasion. We welcome you to call our taproom ahead of time if you have a big group, but there are no guarantees on seating. Here’s our Grand Rapids taproom phone number: 616.776.1195 and our Detroit taproom phone number: 313.335.3440. We also have a private event rental space available for booking in both Grand Rapids and Detroit. We have a big group of industry professionals coming into town for a convention—can we get a coupon or discount for this group? We do not do any coupon-ing or discounting in our taprooms—other than our daily specials. This applies to all situations, including bar crawls. Do you offer tours of your facility in Detroit and Grand Rapids? We are currently only offering tours of our Grand Rapids facility. Please click here to view available days and times and to make a reservation. Do you offer tours of the caves? Nope! We try to minimize the number of people who are in the caves for safety reasons. Similar to our other production spaces, we try to limit it to only the people necessary. I’m organizing a charity event and want to pour your beer for our participants to enjoy. How do I go about getting a donation of Founders beer? OR I'm interested in having Founders sponsor my event. Please fill out our sponsorship/donations form right here. I’m a producer for a film or television show, and we want to show Founders beer in one of the scenes. We have a beer locator that helps you find our beer in your area; it’s searchable by zip code. It isn’t foolproof—it’s fed by data from when our distributors sell our beer to retailers, and lists retailers based on sales in the past 60 days. However, it’s fairly reliable. We recommend calling the store/bar/restaurant before heading in if you’re heart’s set on a particular product, to make sure that it’s there. *Also, please note that not all of our distributors provide data to this database. In that instance, please call them at the number provided on the beer locator page. We’re a retailer of yours—please add us to your beer locator. First of all, thank you for carrying our beer! Our beer locator is populated by data that we get from Vermont Information Processing and is based upon sales from our wholesalers to retailers, like yourself, within the past 60 days. If you have not purchased our beer within that time frame, or if our distributor in your region does not contribute data to VIP, that would be why you aren’t listed. Unfortunately, it’s an automatic process and there’s nothing we can do to override it. However, if something about your listing is inaccurate—say, your phone number or your address—please email social@foundersbrewing.com to get it sorted out. When will you distribute to Utah and Hawaii? We are in a state of growth, but if you can’t find our beer in your area using our beer locator or looking at the states with phone numbers listed on that page, then we aren’t there yet. We are continuously working on distributing our beer to all 50 states while still growing our international market. As always, we are working on growing responsibly and that means we are working to satisfy the demand for our beers at a rate that we can keep up with in our production facility. However, that doesn’t mean we won’t be selling our beer in your state someday—we want to share our beer with all of those that want it, so we do hope to continue our growth to the four remaining states. I’m trying to brew a (name a Founders beer here) clone. Can you share any recipe information with me? Sorry, but we do not share recipe information on any of our beers. A lot of folks here started as homebrewers, and we wish you luck in your endeavors! We do, however, have some tips for homebrewers available here. Will you make Nemesis again? What about Lizard of Koz? When will Blushing Monk be released again? What are the calories in your beers? How many carbohydrates are in your beers? Are your beers vegan friendly? Being designated a gluten-free product requires special equipment and procedures that our facility is not equipped for. It also requires that all raw materials come from gluten-free facilities, which is something that we cannot do with our current offerings because of the grain that we use in our recipes. We do not currently have plans in place to make a gluten-free beer. Not all of our products contain wheat. This is not to say that our beers are wheat-free; several beers in our taproom (they generally have the Wheat in the name) along with All Day IPA have wheat in their build up. Those with celiac disease should consult their doctor about drinking any of our products, and, again, please be aware that All Day IPA does have wheat in the mash bill. I have nut allergies. Can I drink your beers? Please note that while we do not often add nuts to our beers, with the exception of Cashew Mountain Brown, our facility is directly connected to our taproom, where peanuts are commonly consumed. The possibility of a cross contamination of peanut dust does exists. Because of the varying degrees at which people suffer from nut allergies, we would advise you to talk with your doctor about the risks of consuming our product. Founders does not label any of our products as “peanut-free”, and we can’t say whether our beer would be safe for someone with nut allergies. Also, it is important to note that several of our raw materials come from facilities that also package and produce nut products. Our products are not certified kosher. We can’t ship beer directly to consumers. We understand how beautiful it would be to have a case of beer show up at your doorstep, but it just can’t happen. At least not shipped from us. The only way to get beer directly from us is to visit our taproom and Company Store in either Detroit or Grand Rapids during our open hours (scroll to the bottom of this page to see those). But there are lots of wonderful Founders supporters out there that are willing to help you out: find one in your area using our beer locator! Can I buy bottles/kegs directly from the brewery? Yes, on site in our taproom and Company Store. You can purchase gift cards on our website for use on-site in Grand Rapids and Detroit in our taproom, deli and Company Store. At this point, we do not have the capability to process payments for online orders using gift cards. How can I be the first to find out information? Follow us on Facebook, Twitter, Instagram, subscribe to our newsletter or check this out. What do you do to give back to the community? Where can I learn more about this?